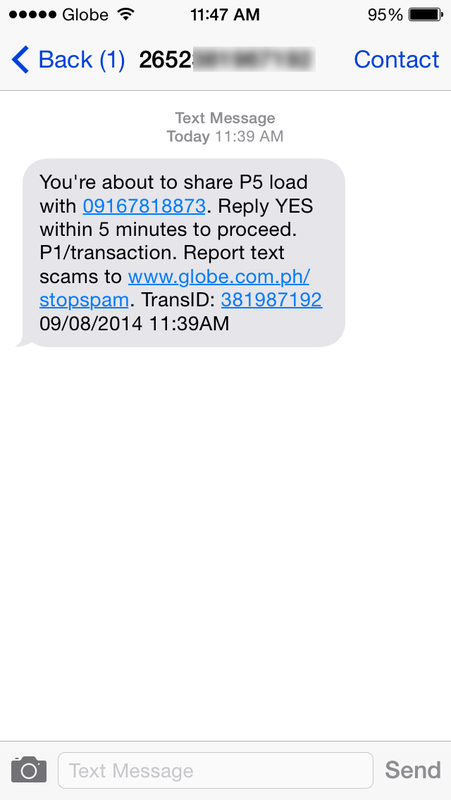 In response to the currently widespread Share-a-Load scams, Globe is implementing a validation text message whenever customers are opting to make a transaction. The additional step is defined by Globe informing users that then have opted to share a load with specified amount to a specified number. The message will then ask you to reply with YES within 5 minutes. If you fail to reply, the transaction will be considered as void. Of course, this is free of charge; transaction fee will still be Php 1 per Share-a-Load. The validation message would come from 2652xxxxxxxxx where the last 9 digits are the transaction number. Replying to the message is free of charge. On the other hand, customers who fail to reply within 5 minutes will receive the following message: "We're sorry, but your Share-A-Load/Promo transaction has been cancelled because the response time exceeded 5 minutes. Please try again. Thanks!" “We want to continuously protect our customers against these scams. By putting in place this additional measure, we would help prevent our customers from unwittingly undertaking Share-A-Load transactions,” said Yoly Crisanto, Globe Senior Vice-President for Corporate Communications. She noted that even with widespread communication efforts, some customers are still unaware that by adding the number “2” before the 10-digit mobile number of the recipient, they are actually doing a Share-A-Load transaction. Crisanto also urged Globe customers to immediately report thru http://www.globe.com.ph/stopspam and provide all the details required. Numbers that are reported as source of text scams will be immediately blocked from the network. Following the telecommunication company’s intensified efforts to combat text spams and text scams early this year, the number of reports using the website has reached over 42,000 since it was created in June 2014.